Is 1st trip DTC detected? YES >> Proceed to EC-372, "Diagnosis Procedure". Remove the intake air duct. Refer to EM-25, "Exploded View". 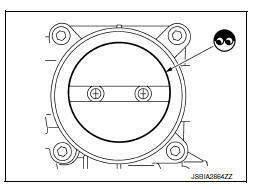 Check if foreign matter is caught between the throttle valve and the housing. Is the inspection result normal? YES >> Replace electric throttle control actuator. Refer to EM- 27, "Removal and Installation". NO >> Remove the foreign matter and clean the electric throttle control actuator inside, then perform throttle valve closed position learning. Refer to EC-139, "Work Procedure".